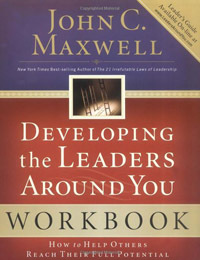 Developing Potential Leaders is a brief overview of the process of developing the right people for the right positions. Developing Potential Leaders is the highest call of leadership. Developing Potential Leaders is the highest calling of leadership. The process is designed to build into them, to bring out their best qualities, to develop their character and to help them discover and reach their potential as future leaders. Because the development of leaders requires time, attention and commitment, you will only be able to work with a few people at a time. You nurture all your people and you equip many; however, you will only be able to develop a few - a few who are ready and willing. To develop people, you will need to understand the differences between nurture, equipping and development. Nurture is about establishing. Equipping is about training and development is about personal growth. All personal growth begins with motivation. As a developer of leaders, you will need to discover their motivation and harness it. Find out what they want. Help them get what they want and reward them if successful. A developer of leaders is a good listener. He hears their ideas and give them opportunity to contribute. Every idea is a good idea until you have settled on the best idea. As the old saying goes, "If you aim for nothing, you will hit it every time." Therefore, you need to set in place a plan for growth. This requires putting aside time each day for growth, quickly file away what you learn, quickly apply what you learn, grow with someone and plan your growth and follow it for a year. Putting time aside each day means spending time with God, listening to tape or videos on leadership and reading books about leadership. A daily discipline will pay great dividends for your personal growth. The point of the growth journey is not the arriving but what you learn on the way and whom you have become on the way. New concepts are best learned visually. Let them see the new concepts (relating to leadership development) so that they can understand them. Emotions play a part in accepting new concepts. Give them time to adjust emotionally. Once they understand, they are ready to give them a try. After people see something new, accept it emotionally and experience it positively, it usually becomes a conviction, that is, it becomes a part of their thinking and their belief system. Vince Lombardi said, "The quality of a person's life is in direct proportion to their commitment to excellence, regardless of their chosen field of endeavor." When excellence is the standard, the best will hit the mark every time. Praising people takes effort but it is pretty easy to do. However, dealing with negative behavior is tougher. Many people avoid conflict. However, this only worsens the situation. Conflict resolution at its best is a win-win situation. Keep in mind these guidelines for conflict resolution and you will have many win-win situations. Positive confrontation is a sure sign that you care for a person. For more information about this subject, click on developing potential leaders.